I haven’t been blogging about sports or the NFL for a few months, and I might not ever blog about it to the extent I did in 2014 again. As we head into the Draft, however, I feel that I need to release my 1st Round mock draft – and give you my thoughts on who I want in Chicago. Here are my three favorite players in this year’s Draft: Marcus Mariota, Landon Collins, and Danny Shelton. On monday December 29th 2014 the Chicago Bears fired three very important people. First it was general manager Phil Emery, then head coach Marc Trestman – and finally Aaron Kromer. Along with that, new information surfaced about the hiring of Marc Trestman. This post will tell you why you need to fire these three men – and who I would like to see in Chicago in 2015. Before doing that though, let me state the obvious – the Trestman/QB-Guru project was a disaster. So, Phil Emery is perhaps the most shocking sack of the season for non-Bears fans. Let’s state why he’s gone. Emery stated that they would progress, become even better – when they actually went from 10-6, to 8-8 and now 5-11. Emery hired Trestman to fix the offense. He did not. “At the time, the plan was to retain the highly regarded Marinelli to run the defense. And he had planned to, remaining on even after close friend Smith was fired. But back in mid-January 2013, as part of their final selection process for a head coach to replace Smith, Emery and the organization had Marinelli interview the three finalists for the head-coaching job. Marinelli was asked to rank the three. He did. Arians was his runaway first choice; Bevell was the second; Trestman was a distant third. When he learned of the decision, Marinelli abruptly angrily resigned and left Halas Hall for Dallas and a de facto demotion to defensive line coach.” – John Mullins, CSNCHICAGO.COM. So, this is basically self-explanatory. The same can be said for Kromer and Trestman. Aaron Kromer outed his personal problems with Jay Cutler to the press… Inexcusable, instantly fired in my humble opinion. Destroying an offense you were hired to fix. Doing the reverse-Lovie Smith (not having balance defensively). Not utilizing your best player (Matt Forte), i.e. not running the ball. Jeff Ireland – former GM of the Miami Dolphins. This guy has plenty of experience, his granddad has ties to the Bears – and he himself was a ball boy for the Chicago Bears once. This could be a perfect fit. Mike Shanahan, former LA Raiders, Washington Redskins and Denver Broncos Head Coach. Rex Ryan, former New York Jets Head Coach (son of former Bears DC, Buddy Ryan). Dave Toub, former Chicago Bears Special Teams Coordinator. Greg Roman, current Offensive Coordinator of the San Francisco 49ers. Dan Quinn, current Defensive Coordinator of the Seattle Seahawks. Any thoughts on the Chicago Bears? 5 weeks into the regular season of the 2014 NFL season – and the Chicago Bears are 2-3. Now, let’s be clear, I didn’t completely expect the Bears to beat the 49ers at Levi’s, but, I expected them to beat Buffalo, Carolina, the Jets and then Packers at home. In my head, I saw the Bears as a 4-1 team after 5 weeks. But, no, we’re not there yet. And in today’s Foreign Perspective-essay I’ll focus on the Chicago Bears. They aren’t who they thought they were, who we thought they were, but they are who the Packers thought they were – overhyped. With that having been said, the world isn’t falling apart, this is football – not the end of the world. I’m not angry, I’m sad – but mostly I’m confused. The Bears should be better than this. Let’s start by briefly analyzing each game this season – what did we expect, what happeneed, what worked – what went wrong? First up were the Buffalo Bills at Soldier Field. Going into the game everyone thought the Bears would destroy the Bills. Every piece of the Chicago offensive-machine was better than their Buffalo opposition. Michael Irvin had mentioned Jay Cutler as an MVP candidate, and the Bears were set to rule the NFC North. The Bears could only disappoint, and sooner rather than later the Bears were being executed on live television. Jared Allen had never won at Soldier Field, and this was not his day to break that record. Surprisingly, the Bills took the win in overtime – and the only memorable thing from that game was an active Matt Forté. 0-1 to start the season – trying to catch up. Then came the big, signature Jay Cutler win at Levi’s Stadium in Santa Clara, Calfornia versus the 49ers. The Bears were expected to lose, but did not, they prevailed after a tough beginning to the game. As Brandon Marshall planted a kiss on Jay Cutler’s head, every Bears-fan knew how it felt to win due to a team-performance. As Trestman said, the team played for four quarters – something you’ll later see being a problem for the Bears. The big thing for me, other than the Cutler-to-Marshall connection thriving, was the emergence of Kyle Fuller – 1st round rookie cornerback. These were the Bears we wanted to see, and they spoiled the Levi’s party. 2-1, at home, versus your biggest rivals. A. Must. Win. Game. You cannot lose at home to the Packers, and expect to win the NFC North. And the Bears started well, slinging the ball down the field well. Scoring points, and we looked like a top tier offense – finally. However, our defense? Well, they could not hang on. Aaron Rodgers destroyed our secondary – humiliated our team – and Mel Tucker could do nothing to stop it. Eventually, some bad referees would pulverize the Bears’ hopes for a lead at the half. In the second half? Well, the offense didn’t show up – and we were still out looking for a brand new defense. We were humiliated, detroyed – at home – versus the Packers. This time, Trestman, the Bears did not play for four quarters – and they were not awake. The only positive thing was the running game. Finally, it worked – but, it did so when everything else failed. And that brings us to last week’s game versus the Carolina Panthers. Against Carolina we couldn’t stop shooting ourselves in our feet. But the thing is, even after going down 7-0 due to a stupid penalty-move on our Special Teams – we were actually playing well. The Cam Newton-offense is not bad, but the defense has been. At a certain point in the game we were up by 14 points – and were looking to score even more in the 2nd half… However, that was not really to be. Trestman likes to play the game for 4 quarters, as has already been highlighted today, but this was yet another game wherein we did not. Jay made mistakes, yes. Forte fumbled, yes. Gould missed the FG, yes. But we were too conservative offensively, and were only rushing 4 men defensively. Embarrasing to drop 2-3 when leading by 14. We’re 2-3, and have a lot of tough games coming up. I feel worried, but I’ve been confident in Trestman and Emery for a while. Tucker and DeCamilis aren’t working out properly, and Emery needs to find someone else for their positions. But… This is still a work in progress, and it could be a lot worse than 2-3. Cheer up, fellow Bears fans. Following what was a perfect week for me, prediction-wise, we go into a week full of action – particularly over here in Europe – as the Oakland Raiders get ready to dismantle a stuttering Miami Dolphins team. We also enter a week wherein we’ll see the great rivalry of the National Football League – the Green Bay Packers versus the Chicago Bears – both are storied franchises, the former with one of the best quarterbacks in our day and age, and the latter with a stellar receiving team. Neither the Packers nor the Bears are without problems – and that’ll undoubtedly lead to turnovers. I will predict the outcome of the aforementioned matches, along with two other games that I find peculiar; but first, let’s look at the new and improved I’m Jeffrey Rex Power Ranking. As always a pretender, the best team of last week, as well as the worst, will be highlighted. Not so Eli-te, but still a Manning. Remember when the hot topic in the National Football League was whether Eli Manning was indeed elite, or perhaps if he was even better than his brother? If you don’t, then you’re one lucky camper. For two years, Eli Manning has been performing extremely poorly – and he can no longer call himself an elite quarterback. Thankfully, for the Giants, they aren’t facing one when they meet the Redskins. With Robert Griffin III out injured, the biggest position in sports will be filled by the Chad Pennington-lookalike Kirk Cousins. Don’t get me wrong, I like him – but I’m taking a Coughlin-led Giants team over a rookie head coach w/ a backup quarterback any day of the week. Raiding London. A disgruntled Miami team goes to London to battle a rookie-led Raiders team. I see Derek Carr beat the Tannehill-led Dolphins. Saint Survival. New Orleans have been poor, disappointing in truth, but I see them getting a tough win against a running-Dallas team. Cutler’s Takeover. The Bears have a great opportunity this week. They are able to push Green Bay to a 1-3 record, whilst maintaining their own top position in the North. Aaron Rodgers will have to perform to his best ability if he is to beat the potentially deadly Bears offense. And I? I doubt the Packers will be able to handle it. Bears win. My overall prediction score is still at 75%, and I go into this week with four new week predictions. This week I’ll once again note an updated Power Ranking, and a pretender. New this week, I’m naming the best team of last week, as well as the worst. Unbalanced Lovie: So far this season, Tampa Bay has not done anything truly spectacular. As we saw in Chicago, Lovie Smith is not a good coach for the offense – and one wonders if this trend will continue in Tampa. When the Bucs go to Atlanta, they will be beaten by a much better offense. Matt Ryan takes the win. The Saints Are Coming: I predict that the New Orleans Saints will get back on track by beating Minnesota – and getting their first win. Started From The Bottom…: I believe, and predict, that the Bears will beat the New York Jets on Monday Night Football, and keep control of their division – tied for 1st place. Motor City Win: My final prediction of the week is that the Green Bay Packers will drop to 1-2, by losing to the Detroit Lions. I don’t see anything special in Green Bay, other than their no. 12. Detroit will win. In this ‘essay-like’ series under the name ‘Foreign Perspective’ – I’m trying to elaborate on views of a European, when seeing traditional American news or results. This includes, but is not limited to, potential political topics. My main focus, however, is the Chicago Bears – an American Football team that I love. How do I see the recent news and results lining up? Do I even understand this sporting mentality? Find out in the Essay Series ‘Foreign Perspective – Chicago Bears’. On Sunday September 7th, the Chicago Bears opened their NFL Regular Season (2014/2015) against the AFC East Buffalo Bills. At Soldier Field, expectations were big – seeing as the Bears have been stellar against the Bills at home, and generally in the opening game. However, the Bears proved that this year won’t be as good as most people expected. I, perhaps infamously, predicted a 12-4 season – I drank the kool-aid, and believed the hype. But the Bears ultimately fell to the Buffalo Bills 23-20. Now, I have a couple of notes and views on the game. 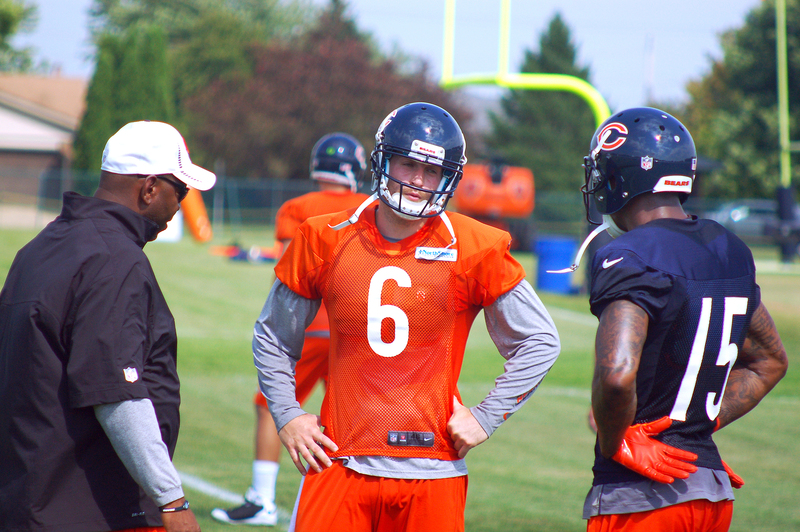 This week’s Bears Essay is entitled: The Good, The Bad and The Inexcusable. Most of the things we saw at Soldier Field were bad, but it’s important to remember that it didn’t start that way. The Bears opened the season by forcing the Buffalo Bills 3-and-out. The Defense we wanted to see. When the Bears got the ball, they were fast and furious – an on-point Jay Cutler led the Bears down the field, and finished it off with a Touchdown to Martellus Bennett – a Tight End who had a big role to play in the opening week. It all went downhill from there. Did the Bears think it was an easy win? Well, the game proved to be a trap-game. E.J. Manuel took his team down the field, by exploiting the Bears’ defensive holes – using Robert Woods to perfection, for one. The Bears let the Bills take an easy Touchdown. Tied at 7-7, I wasn’t panicking – not at all. But then the Bears offense made the same mistake that the defense did – thinking it was too easy? Sure, maybe. Hubris? Definitely. Trying that flea-flicker was obnoxious – and the playcalling was essentially terrible following the opening Touchdown-drive. The Bills quickly went up 17-7, and the Bears were booed going into the half. And Cutler’s first interception of the season, directly led to a C.J. Spiller Touchdown. What happened during that play? I think Martellus Bennett was running a hitch-route, but failed to turn around and catch the ball Cutler was throwing – a missed play by Bennett. These missed plays continued, as Cutler was unable to lead the Bears back to a win. It wasn’t made easy for him, though – as Garza, Slauson, Morgan, Jeffery and Marshall all had injuries during the game. Now, Martellus Bennett is not the bad, the good or the inexcusable. He had an average day, and his performance had both plusses and minusses at the end of the day. The Good was Matt Forte. He ended up with a total yardage of 169 yards – and was the one positive aspect of a game, wherein I expected very little from Forte following a mixed pre-season. I label Jared Allen as ‘the bad’. But in reality, the defensive line should be labeled so. Jared Allen was particularly disappointing – and maybe both Allen and, the new Packer, Peppers are over-the-hill. As for the inexcusable? Jay Cutler. He did okay early in the game, and I don’t blame him for the first interception. But he did hold onto the ball too long, he did make two throws that easily could’ve been picked. And his second interception forced me to label him as inexcusable.He’s got his big deal, he’s got the big receivers – his type of coach. He didn’t take home the win – and he has no excuses when he throws directly to Kyle Williams. Throw it away, Jay. Next week the Bears face the San Francisco 49ers, and they look good – like I expected – but it’s probably the best chance the Bears have had of pulling off an upset in San Francisco in a long time – with the defensive lack of health and new stadium in mind. Student Becomes The Master: I predict that Ron Rivera will outshine and beat Lovie Smith’s Tampa Bay team. Home Field Advantage: I predict that the Seattle Seahawks will defend their turf, and beat the Green Bay Packers in the opening round of the 2014 season. Bad News Bears: I predict that while the Bears beat the Bills, Matt Forte will underperform severely. Good Start: I predict that Bill O’Brien will lead his new Houston Texans team to a week 1 win against the Gruden-led Redskins.